Emily Chubbuck Judson (1817–1854) was a nationally known writer of the mid-nineteenth century. Writing as Fanny Forester, her creations appeared in the national magazines (The Columbian, The Knickerbocker, Graham’s Magazine, The New Mirror) alongside works by Edgar Allan Poe, James Fenimore Cooper, Henry Wadsworth Longfellow, and other literary icons of the era. Her work included children’s books, essays, poetry, and fictional stories. She was a prolific letter writer. In 1845, she met Adoniram Judson and they married in 1846. His pioneering work in Burma (Myanmar) made him famous as a Baptist missionary. After his death in 1850, Emily returned to the States in 1851 and spent the last years of her life writing and publishing a volume of poetry, a volume of missionary stories, and a memoir of her sisters who had died as young women. She also worked with Dr. Francis Wayland, president of Brown University, on a definitive biography of Adoniram Judson. Volume 7 begins with a poem written when Emily was nine years old (1826) and ends with “My Angel Guide,” written in 1853 prior to her death in June 1854. Between are several hundred of her poems, many of them newly discovered in the papers of her great-grandson, Dr. Stanley Hanna. This is all of her poetry published and unpublished as we know it. Also included are twenty fictional pieces from the magazines that are not included in her several published anthologies. 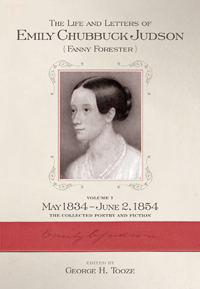 The seven-volume series of The Life and Letters of Emily Chubbuck Judson (Fanny Forester) is published in cooperation with the American Baptist Historical Society.